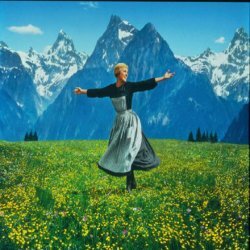 How many children are in the Von Trapp family in the film The Sound of Music? In the film, the family had seven children. The children were Lisel, Louisa, Fredrich, Kurt, Brigitta, Marta and Gretl. The story is about Maria, a novice from a nearby convent that is recruited to become the family’s governess. The movie is loosely based on the real story of the Von Trapp family. This movie debuted in 1965 and starred Julie Andrews, Christopher Plummer, Peggy Wood and Richard Haydn. This Oscar written film was directed by Robert Wise. The film was written by Russel Crouse and Howard Lindsay and the music was written and composed by the team of Rodgers and Hammerstein.